Student participation waivers can be downloaded here, English and Spanish, versions available. Our Hope Centers are always in need of special items. If you would like to donate, please check out our wish list. All donations can be brought to our Cy-Hope Headquarters at 12715 Telge Rd. Thank you! Click here to check out our new online Cy-Hope Donation Store that will provide a running wish list of needed supplies for our Hope Center kids throughout the year. 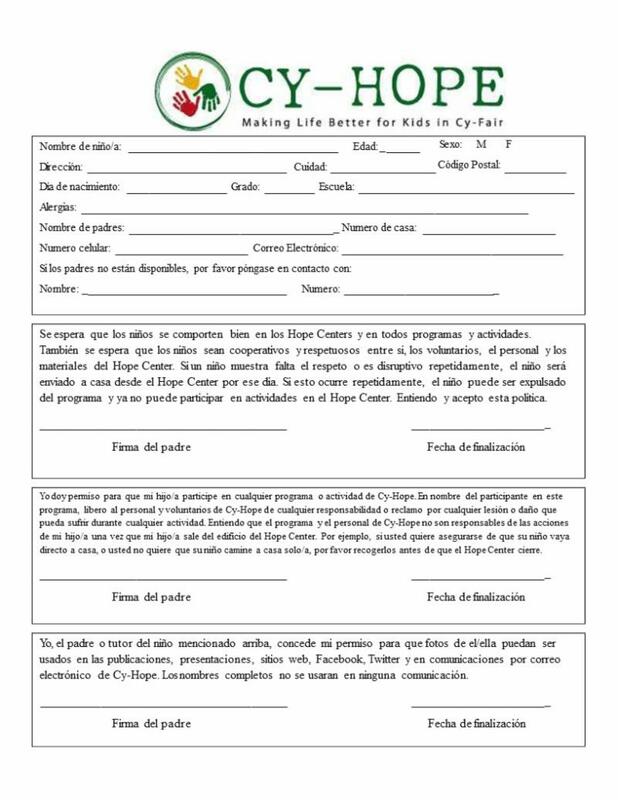 Interested in helping our Hope Center program? If you're interested in volunteering at a Hope Center, check out the information below. If you're interested in making a donation, click here for the Hope Center's wish list; donations can be dropped off at our headquarters (12715 Telge Road, Cypress). 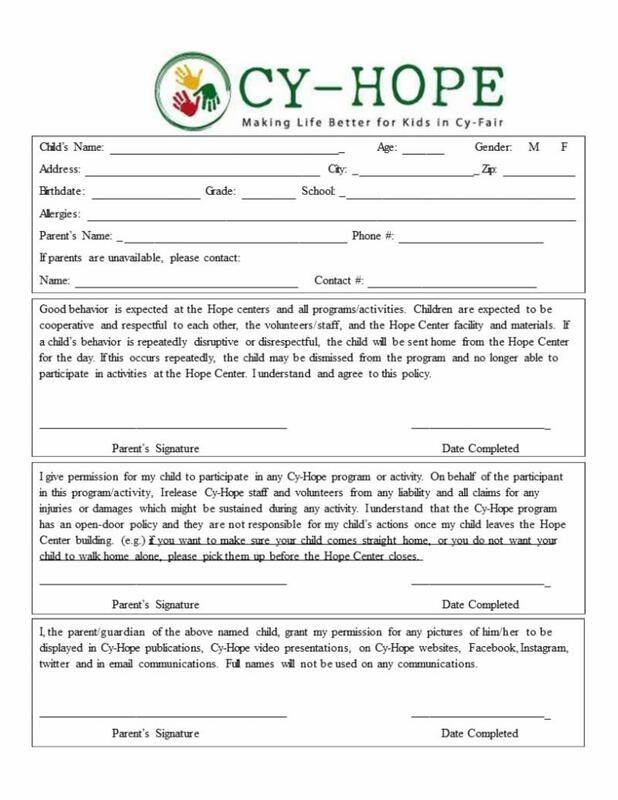 Opportunity: The Hope Center volunteer has an amazing opportunity to impact the lives of young kids. The volunteer will achieve this by developing a relationship with kids at the Hope Center. Volunteers should help the Hope Center interns and other volunteers with educational time, crafts, snack, games and recreational activities. They will encourage the kids to complete their homework and participate in educational activities. Their main purpose is to serve as a positive role model for the kids at the Hope Center. Monday and Wednesday at Longhorn Hope Center 4:30 - 6:30 p.m.
Wednesday and Thursday at Pointe Hope Center 4:30 - 6:30 p.m.
Tuesday and Thursday at Windfern Hope Center 4:30 - 6:30 p.m.
Can serve at one, two or all four Hope Centers (Windfern, Longhorn, Pointe, and Enclave) (please let Director know if you have a preference). For more information, email Genna Peard.